like most champions league match days, i’ve spent my most of my evening watching the glut of games recorded on my DVR over the course of the work day. i love champions league group play, so much quality football my brain wants to explode. i decided to round out my evening by watching the arsenal-olympiakos match, and as i expected, the game was a typical –yet successful– outing for the gunners. and though the there were certainly more interesting games to discuss tonight (clears throat… liverpool, i’m talking about your embarrassing showing), the arsenal game stirred my thoughts the most tonight. as in most games against inferior competition, arsenal dominated possession and the flow of the game. the home side piled 22 shots on greek keeper antonis nikopolidis, who was my man of the match thanks to a collection of stunning saves, and they should have scored at lest four or five times. but despite all of their opportunities and possession, the gunners didn’t break the deadlock until the 78th minute. tonight’s was a perfect example of one why many believe that arsene wenger needs to finally dip into his transfer kitty and improve his side with some quality players. it’s become a trademark of the club in recent times. a dominating performance, creating a plethora of opportunities that produced very little other than just that: opportunities. sure, they won 2-0 tonight. but goals should be much more plentiful for the gunners with the number of chances they create for themselves with their silky ball movement. hell, it took a team with the following attacking talent on the field at one time to finally put in those two goals: van persie, arshavin, eduardo, carlos vela and fàbregas. wenger remains adamant, though, that he does not need spend big and add more talent to his squad. the frenchman has plainly said for the last two years that he feels that he has enough talent in his youthful squad to contend on all fronts. i for one believe him… for the most part at least. yes, the gunners could probably use a veteran holding midfielder to add some steel to their midfield and provide some protection to their back line. but anderson seems to finally be coming into his own, and alexander song does a decent enough job (in fact, song played really well tonight). but who would they get to fill this roll? dishing out big money could only really be worthwhile if you could land a gareth barry, javier mascherano or gennaro gattuso type of player. and could they really get those players? debatable. so that position aside, why do i feel like wenger is making the right decision in not splurging on a big name signing? because there is enough quality in the squad already. they’ve all just been injured for much of the last two years. 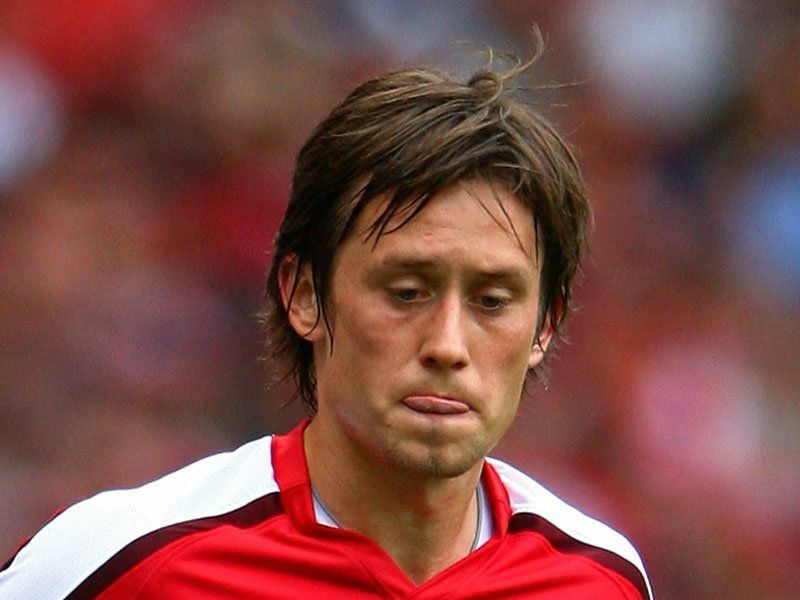 tomáš rosický spent an amazing 18 months on the sidelines between january 2008 and earlier this month, due to a bizarre recurring injury. eduardo’s infamous broken leg against birmingham (viewer beware of that link) in february 2008 kept him sidelined for a long stretch, only making four appearances for the gunners last campaign. he’s just now regaining his form. fàbregas spent a good portion of last season on the sidelines due to serious knee injury sustained playing against liverpool. theo walcott’s overuse by the english national teams seems to have taken it’s toll, as he can’t shake his recurring shoulder injuries. he has yet to make an appearance for arsenal this season. samir nasri’s broke his leg in preseason this year, and isn’t expected to be back playing first team football until mid to late october. denilson’s improving form is going to take a hit, as he’s expected to spend the next 8 weeks on the bench due to a stress fracture in his back. nicklas bendtner injured himself in a car wreck before today’s champions league tie… and i don’t think the team will miss him terribly. man, this guy’s futility on the field drives me crazy. so, his absence isn’t really that big of a deal. the conundrum arsenal face is fast approaching: how do you fit all of these players into a line up? almost all of them will be returning to action in the coming weeks. how is the professor going to arrange his team, and who is going to be their starting eleven? and as i look at that line up, thinking of it’s dazzling display of glitzy talent, even i have some doubt about it. minus the dutchman up front, that’s a really small front six. and that’s why i think we see song, bendtner and diaby getting into the line-up often times, to provide some much needed arial height. maybe one of diaby or song would replace nasri. i wouldn’t even put the big dane in though; he’s crap. even with a blown ACL, i feel like i could be more productive on the field than the nicklas ever is. to be honest, i just don’t know how to line them up. arsene will have a serious dilemma on his hands here shortly. he has been right in saying he does already have a wealth of talent at his disposal, once everyone is healthy. how is he going to juggle it all, arrange it, and place it on the field to challenge for all four major trophies this season? you’re guess is as good as mine. obviously finding the right chemistry will be key, and rotating his squad to keep it fresh, healthy and player egos content will also be important. arsenal’s conundrum is one i’m glad i don’t have to deal with, though i’m very interested to see how wenger handles it. his is a job a certainly don’t envy right now.